Scientists Find Million-Year-Old Superbug In New Mexican Cave : Goats and Soda Scientists were shocked to see what happened when this ancient bacterium encountered modern antibiotics. But here's the kicker. This bacterium has been isolated from people, society — and drugs — for 4 million years, scientists report Thursday in the journal Nature Communications. That means it hasn't been exposed to human drugs in a clinic or on a farm that uses them. But it has the machinery to knock out these drugs. And that machinery has been around for millions of years. "People are like, 'Oh no! It's a superbug!' says Hazel Barton, a microbiologist at the University of Akron, who helped find the bacteria. "But I prefer to call it a hero bug." Because, Barton says, the bacterium is helping scientists understand where antibiotic resistance comes from and, hopefully, new ways to stop it. And the bacterium — called Paenibacillus (pronounced "penny-bacillus") — isn't pathogenic. It won't hurt you. It's just capable of evading many, many antibiotics. Barton and her colleagues found the ancient super/herobug inside Lechuguilla Cave in New Mexico. 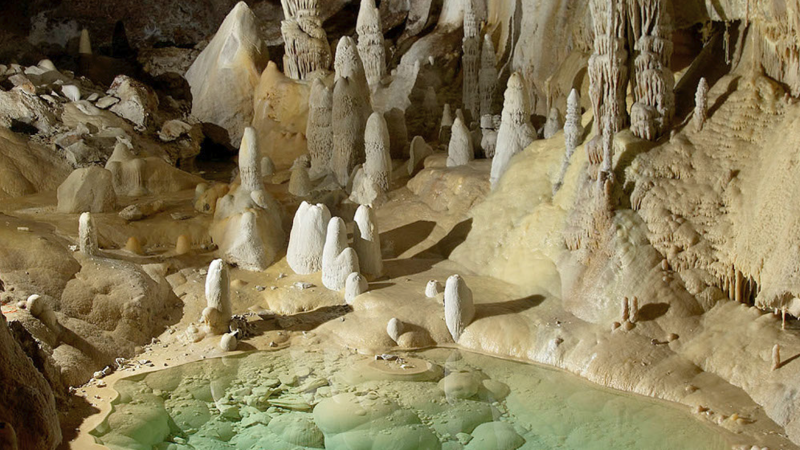 It's the deepest limestone cave in the southern U.S. — more than 1,600 feet at its lowest point. And it's one of the most inhospitable places on Earth. The cave never sees the sun. "It takes about 10,000 years for water from the surface to get into the cave," Barton says. So how on Earth did this underground bacteria become resistance to human antibiotics? Don't bacteria develop resistance after being exposed to the drugs in people and animals? "That's kind of the old model," Barton says. "When we originally went into this cave in 2012, we found that the microbes there were resistant to every natural antibiotic that we use in hospitals. "It changed our understanding because it means antibiotic resistance didn't evolve in the clinic through our use. The resistance is hardwired," she says. Now there's one big caveat. This "hardwired" resistance is true only for natural antibiotics. "About 99.9 percent of all the antibiotics that we use come from microorganisms, from bacteria and fungi," Barton says. "They are constantly lobbing these chemical missiles at each other. And so if you're going to live in that environment you have to have a good defense." The goal of all this lobbing is survival: There are very few nutrients in the cave. So the microorganisms are constantly trying to kill each other and take each others' food. But some antibiotics are manmade. "The bacteria in the cave have never been exposed to these antibiotics," Barton says. "So they're still sensitive them." Earlier versions of this story and the caption said Lechuguilla Cave is the deepest cave in the continental U.S. In fact, it is now the second deepest cave. Tears of Turtle Cave in Montana was recently surveyed to a deeper depth than Lechuguilla Cave in New Mexico.